Piaggio was the first to come up with a viable three-wheeled scooter and its MP3 has never looked back since. 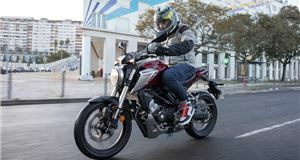 It’s now available in 300 and 500 guises, providing the option of something ideally suited to town riding with the smaller capacity and the ability to commute on the motorway with the larger engined model. That’s an important point with the MP3 as it’s not just aimed at scooter users looking to move up the food chain to a bigger, comfier (and pricier) machine. This bike also clearly has car drivers in mind who are considering a swap from four wheels to beat congestion. 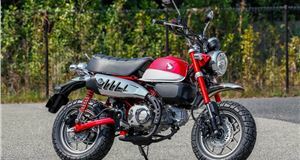 Critically, the MP3’s three-wheel design means anyone who passed their driving test before 2013 can get on these Piaggios and ride off, though we would heartily recommend completing a CBT course beforehand if you have no prior experience of scooters or motorcycles. It’s a clever ploy by Piaggio, and one that’s now been copied by Peugeot and Yamaha. With two wheels at the front, stability is the MP3’s big selling point. Even when you come to a stop, there’s no need to put your feet on the ground as a button on the right-hand bar locks the front end in the upright position at speeds below 10mph. So, you sit there defying the laws of physics and ready to take off as soon as the green light appears. 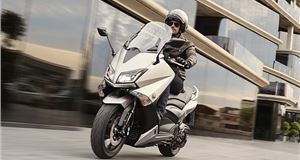 When it does, the 300 model nips away smartly, but you are aware it’s not as brisk as the likes of the Honda SH300i or Yamaha XMAX. 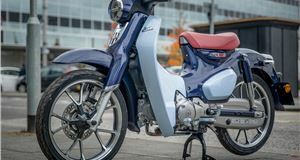 Still, the twist-and-go throttle makes the MP3 as easy as any scooter to get moving and the single cylinder engine is refined and free from vibration. That’s just as well as you have to work it harder than many of its rivals to overcome the weight added by that extra front wheel. Step onto the 500 version and performance takes a marked step forward. True, it’s not as potent as other maxi-scooters with similar engine capacities, but you can easily keep ahead of baying traffic packs. There’s also a lot more in reserve on the larger machine when you want to head further out of town, so dual carriageways and motorway riding is perfectly feasible. However, overtaking slower vehicles on 60- and 70mph limit roads takes a fair bit of forward planning as the engine is nearing its comfortable limits at these speeds. On the 300, you’ll just have to wait for a slower stretch or a queue of traffic to pass safely. This frustration aside, both MP3 models are a pleasure to ride on the open road as the twin 13-inch front wheels give much more grip for cornering and braking. Anyone used to a two-wheeler will need a couple of bends to calibrate their mind to the MP3 experience, but you soon learn to trust the front end completely. 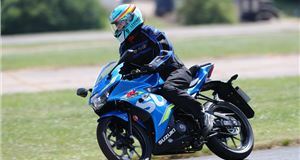 Push too hard in a corner and the front merely runs a little wide and you also have the safety net of standard ASR traction control should the rear tyre relinquish traction. Slowing the MP3 in either guise is no problem as the twin front disc brakes and single rear rotor offer 50% more stopping power than most scooters. You need that extra retardation due to the weight of these three-wheelers, but they still pull up in a shorter distance courtesy of their greater contact patch on the road surface. An ABS anti-lock system is also included, so you can steer round hazards as you slow. One other feature is the foot pedal to operate the brakes in tandem rather than individually with the hand levers. This is the same as a car’s set-up and it works well. Another benefit of the twin front wheel set-up of these MP3 models is the superb ride quality they impart. Where other scooters can be wrong-footed by ruts and ridges, the Piaggio pair glide along. It’s another area where these scooters hold far more appeal for car-driving converts. However, the width of the MP3s means filtering requires more care and attention. Many car drivers will also be happy with the 56mpg of the 500 and 70mpg promised by the 300 as both should cut running costs. Those are our real-world figures as no official numbers were available from Piaggio. With a 12.0-litre tank in both models, you should be able to cover 150 miles on either before the fuel warning blinks on. This alert is placed in a dash that looks like it could have been lifted straight from a small hatch with its twin main analogue dials, and smaller gauges for fuel and temperature. There’s also a simple digital display for other data and a row of warning lights. You can also hook up your smartphone to the MP3 using Piaggio’s PMP connection that lets you see data for lean angles, engine power being used and, most importantly, sat-nav directions. There’s loads of space for the rider and pillion to find the right seating position on either MP3. You could easily travel longer distances on the Piaggios and still feel ready for a day’s work or play. When you park up, there’s the option of a centre stand or you can simply lock the front forks upright. There’s storage under the seat that’s big enough for a pair of full-face helmets and a three-section glovebox comes with a USB charging port. All of this makes the MP3 300 and 500 ideal for anyone looking for the minimum fuss for their daily riding needs. While you do sacrifice some performance with the MP3, the stability and ease of use more than make up for this. And for car drivers thinking about making the transition to a scooter, the Piaggio models could not make it easier or more appealing. 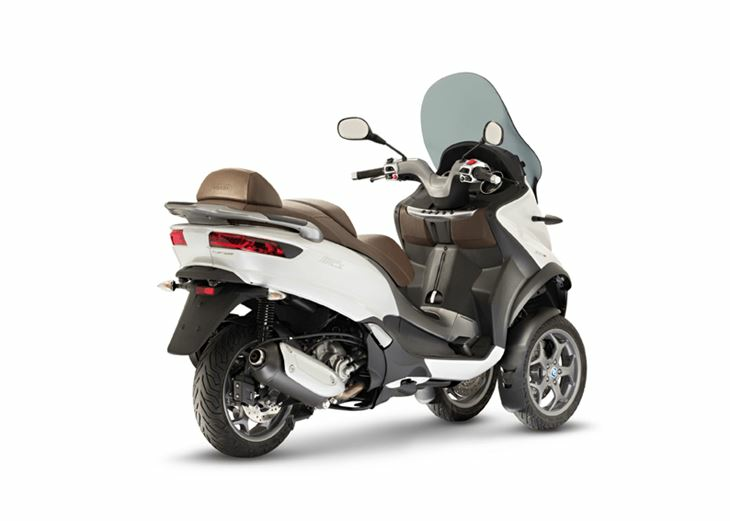 The Piaggio MP3 300IE Business: Top speed 78mph. Fuel consumption 56mpg (est). VED £85. 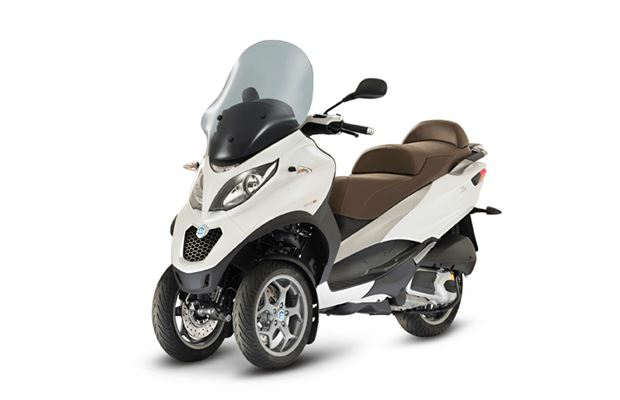 The Piaggio MP3 500 Sport: Top speed 88mph. Fuel consumption 61mpg (est). VED £85.